Hi folks, I discovered that module zip files created on a Mac using the COMPRESS option would not load into Rack Planner properly. The modules would come up blank. This problem has now been fixed and available for download. Please note we are now on revision 1.0.9. There are a lot of great improvements, so if you aren't on the latest version, please give it a try. can someone help me out with sorting the modules? but the folders dont show up when I go to add a modules. I imagine I have to edit one or more .xml file, but I have no idea what im doing. Hi the program doesn't currently support module subfolders. All modules need to be in the directory specified by modulesPath in the rack file. I suppose I could change this. i just wanted to stress how entirely wonderful and helpful this program has and continues to be for me. i would be lost in the modular maze without it and would gladly buy it if it weren't free. 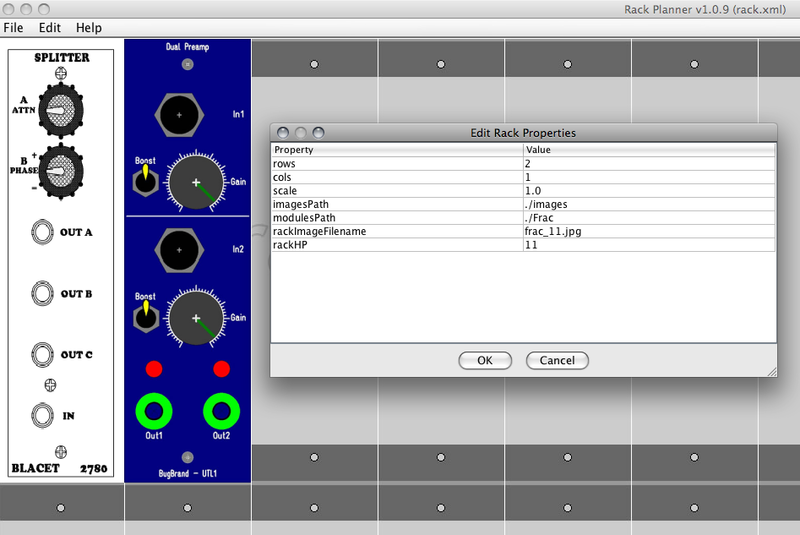 no person trying to compile their dream frankensynth should ever be caught planning without this program. As someone who started using Rack Planner in the middle of the night last night: between the app itself and the support from Squiggletronics...wow! VERY nice. Now one little feature request: maybe a warning when you quit without saving? the app itself and the support from Squiggletronics...wow! VERY nice. The Squiggletronics part is my doing. A whole slew of mostly Dotcom format stuff was contributed today and I just added it to the library. If that was from you, thanks. just want to say thx for this - i have only been using the online one but i cant do anything on my laptop when my train goes underground!!!! Ah, you know I should have put 2+2 together from reading the posts to know who was behind it...but I was busy trying to grok how to use it all! Excellent job you've done to make it easy for people to contribute to the library while helping themselves. Very cool. Yes, I added a bunch of MU stuff this morning. Sorry the images aren't better but I did the best I could with manufacturers' sites and PDFs. Later this year, don't know when I'll get it setup, I'll be looking for people to be "moderators" for the different parts of the library. The moderators would review and accept/reject contributions left by the users of ModuleMaker, and could clean up and make more uniform the names of the modules already in the library. Nominations? I have some other plans too and I think getting a few people on board to brainstorm with would be a good thing. after using this and love it - the only thing i could ask for (if even possible in this format) is a floating window to select modules from instead of constantly having an 'open' dialog box. sorry if this has been requested already - i didnt read through the whole thread. lazy today. Good idea. Not mentioned already. Thanks. Ah, not surprised. I'm probably completely ignoring the path returned by the dialog. That's fixable. Thanks. Excuse the newb question, I'm just dipping my toe into modulars -- is there a 5U/MOTM rack image somewhere? 10U for a 19" standard rack, isn't it? Thanks, the program looks great! Good question. 8 spaces per 19" for an MU rack would be nice too. I just use the Euro rack and ignore the holes. We have more formats supported in the library than there are rack xml files and rack images. I could have the site generate the rack images and xml files in software so that you could pick a format and pick how many rows and columns you want. I think they should be proportional to actual sizes of the different formats. Any suggestions for default scale or anything? Probably best to use whatever scale is most likely to be submitted as modules. If the rack is too small, the module images will always be scaled down to fit, and the results so far have not been great on image reduction. Hey, Doug. I'm wondering how a fellow could lay out a Euro Planner and also a Frac Planner. I'm an XML Knucklehead. How does this work? Can you walk me through it? Holding my hand and all? i think there already is a Frac optionÃ¢â‚¬Â¦ and modules. I've got the Frac Modules installed where my Euro Modules are and they come out smashed up. Just a couple of millimeters wide. I've moved them to their own folder and then they all come out as 1 module wide in size and blanked out in grey. Try looking here. There's some general explanation and links to the readme file and to folders where you can find rack images and XML files for the different formats. You would have to modify the HP property in the XML of each frac module to estimate the frac module width in terms of euro HP. For example, frac HP of one is something like 8 or 10 HP of euro. Image quality on scaling has been fixed.